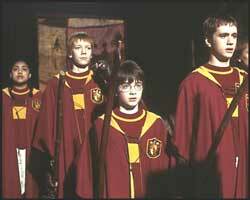 Harry Potter and friends as characterised in the recent film. Magic is an old human practice. It is sometimes defined as deception by showing something to an audience, which is contrary to reality. Magic is listed as the third major sin after Shirk and Murder, according to Adh-Dhahabi in his book 'Al-Kaba'ir' The Major Sins. In my quest to get a better understanding of those that read or watch things related to magic, I was quite surprised to find more Christians addressing this issue than Muslims. In fact I couldn't find one article regarding this issue. And with the recent release of the Harry Potter film, I'm even more driven to find a clear answer. Oh, I've heard the argument: "Harry Potter is wonderful, it encourages kids to read!" But do you really think that Harry Potter is the kind of reading Allah had in mind? Imaginary (or virtual) experiences and well-written fantasies can affect the mind and memories as much, if not more, than actual experiences. Designed to stir feelings and produce strong emotional responses, a well-planned myth with likeable characters can be far more memorable than the less exciting daily reality, especially when reinforced through books, toys and games as well as movies. It is no wonder Harry Potter fans have been counting the days to see the sorcery, magic, potions and spells. Our children need good, moral characters to identify with. When they have been accustomed to reading and now seeing this fantasy we must ask ourselves as their protectors and educators if these are the types of role models we want for them. By overexposing our children to the Harry Potter kind of material we run the risk that they may lose their natural aversion for the devious spirits represented by the creatures and symbols in these stories. Caught up in the exciting story, they absorb the suggested values and store the fascinating images in their minds, making the forbidden world of the occult seem more normal. 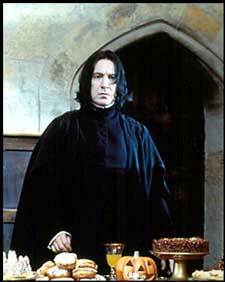 Professor Snape, a teacher at Hogwarts Academy in the Harry Potter film. Fun fantasies and strategic entertainment have a special way of altering values, compromising beliefs and changing behavior in adults as well as in children. This learning process has been named "edutainment" a favored way to educate and entertain at the same time, for example Sesame Street. Its power to influence beliefs and behavior is illustrated by today's marketing firms; which spend billions on entertaining ads that touch emotions, ignore the facts, and yet motivate people to buy the product. This Harry Potter 'ideology' is a good example. It comes complete with trading cards, computer and other wizardly games, clothes, action figures and cuddly dolls as well as audio cassettes that could keep the child's minds focused on the occult all day and into night. What's next, a Ouiji Board? Teach your children Allah's Truths and train them to see reality through the teachings of Allah and His Prophet (peace be upon him) and not through the world's perspective. To succeed, we must be ever-conscious of their surroundings. Is it possible to shield them from contrary values, I'm sure it's not, however it is possible to offer them clear understandings of these things in light of the Qur'an and Sunnah. Once they have learned to love what Allah loves and hate what Allah hates, and to see life from His Words, they will demonstrate their wisdom by choosing to say "no" to Harry Potter and the like. All right, so you've finished reading this editorial and you see things differently. All this time you've allowed your kids to read and view material related to magic, what do you do now to stop it? Every family is different and therefore our approach to this matter will differ. You may need to cut it out completely and sit with your children to explain the situation in detail. We can only be accountable for what we know and our intentional acts. Being a Muslim means always learning. We are always growing and changing our views in order to meet the needs of our Faith at any age. May Allah guide me and forgive me for anything that was said unintentionally, and in any respect not in accordance with Allah and His teachings. He is The All-Knower, and The Merciful.